When I came down to the main road on the 5th day, my original plan was to camp by a water not to far away. But I felt like I both deserved and needed a warm bed to sleep in. 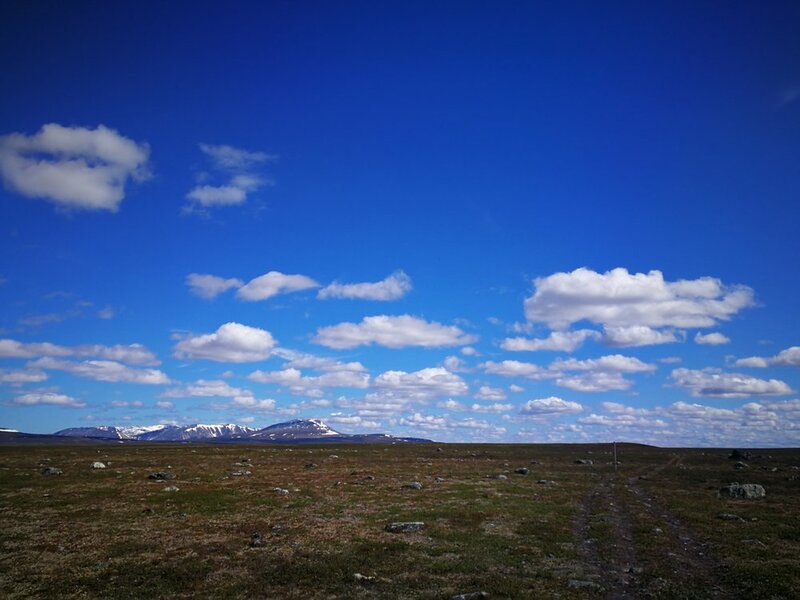 I therefore redirected my route towards the promising name of Olderfjord Hotel, a place the app ut.no described as a private owned tourist cabin. In my eager to get there, I both misjudged the distance and the information about the place. As it turned out, it was only a camping spot, so at first, I was very upset that I had walked a 6km detour for nothing. I thought that the lesson to be learned was to check the information details BEFORE deciding anything. However, I got way more than a lesson. I got a hot shower, I could use a proper toilet and on the opposite side of the road, was a restaurant. So in the morning, I went there and bought myself a breakfast buffet, where I took as much food as my conscious allowed me to. Of what I couldn’t finish, I packed in my backpack for a later lunch. Brilliant! I sat in the restaurant for nearly 7 hours. In that time, I charged all my electrical appliances, updated my blog and facebook page and enjoyed sitting. At 5pm, my hike continued. I was motivated and my stomach was full. After 6 hours, I put up my tent and went to sleep. 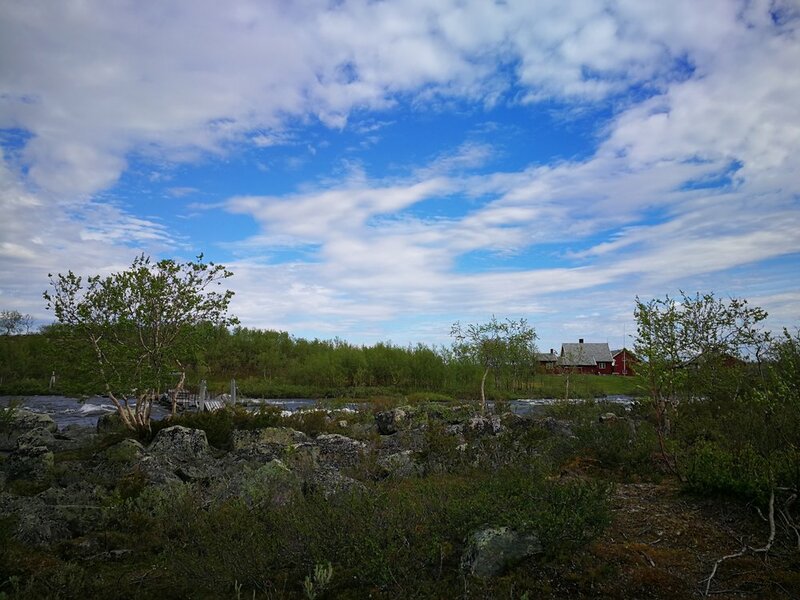 The clouds covered the midnight sun, so I was allowed a whole night with almost darkness. My feet was like led. 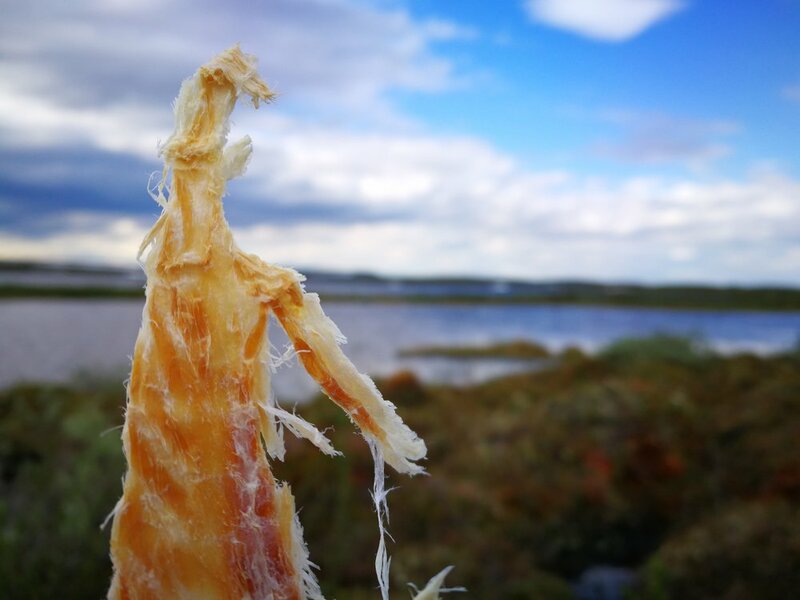 I dragged them along in the wet marshes until I had to sit down for a proper meal to get some renewed energy. It worked to get a hot meal, also because it was very windy and cold. The coldest day so far, only 8 degrees. I had my first chocolate today. I have become very aware of the rivers now (I had no idea there were so many of them in Norway…), I’m constantly looking at the to plan ahead. And today I noticed that the DNT trail was leading me straight to a river that was twice as broad as the one I fell in (day 5). HELL NO! I said and took a detour. I started to stress a little with being behind the schedule, so the detour was not an easy choice. I decided to trust that I had made the right decision, and to take my time. My detour took me around a huge lake, and I intended to round it before calling it a day. 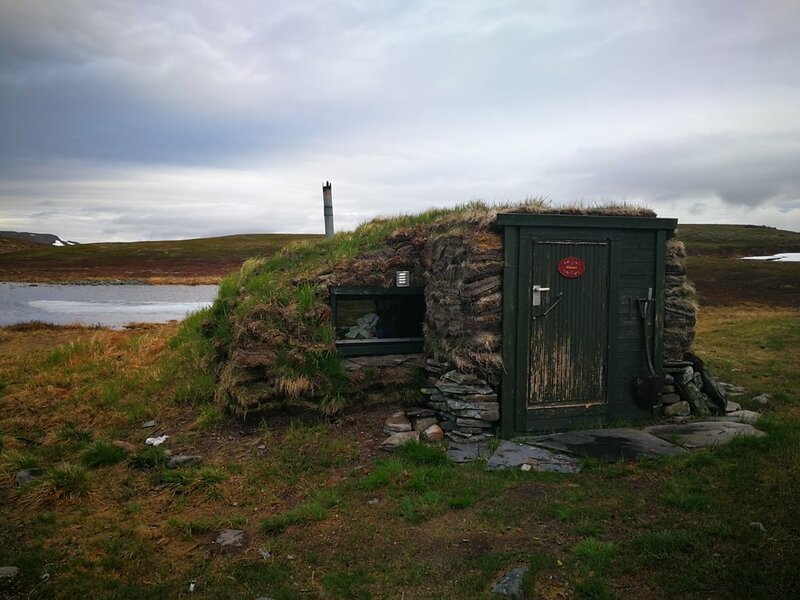 But when I got half way around, I saw a little hut covered in grass with the sign on the door saying “Welcome”. I knocked and entered – it was a cabin I could spend the night… for free. That’s what you get when you trust that everything happens for a reason, I thought happily, while unpacking my backpack and wrenching of my wet clothes. I got the fire going, and the hut immediately turned warm and cozy. Right then, it was very easy to just be in the moment and enjoy the here and now. To walk out of the warm and dry cabin on a rainy day, was not pleasant. After an hour, I was soaked all the way through. I barely took any breaks, just bending down to get the weight off my shoulders, eating nuts while I was walking. It was too cold to sit down. And to cross rivers was nothing but torture. To take of clothes, enter icy water and then try and get dry again while it’s raining, windy and 4 degrees, now that is pain. It made me think about the day I fell into the river. That day it was 25 degrees and not 5. It made me extremely grateful. 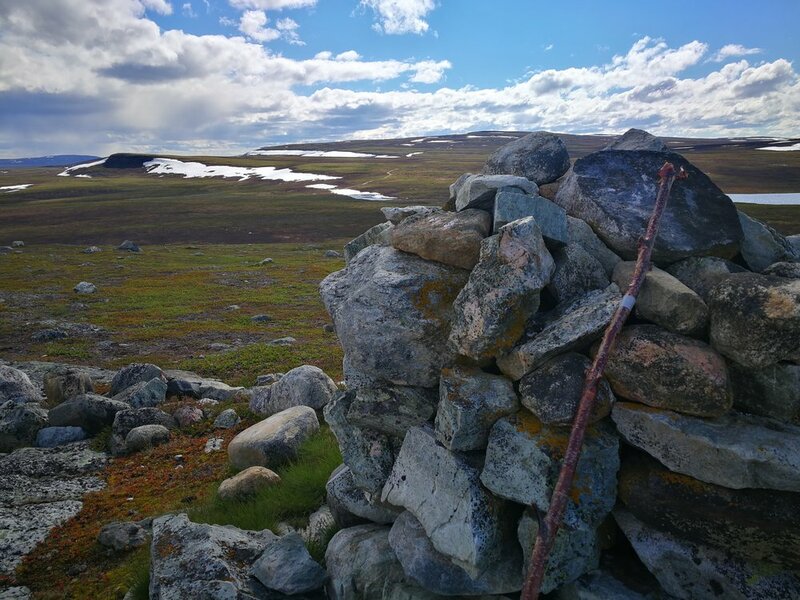 The day went on and on, I kept pushing forward because I had located another small hut on the map that I could spend the night. When I arrived there, however, it was nothing but an outside toilet. In my disappointment and frustration I stumbled around for another hour, looking for the hut. Until I finally fell flat on my face, I gave in, came to my senses and put up the tent on the driest piece of land I could find. I realised that I had been driven by fear for quite some time, my head was either in the past or I was constantly worrying about the future. I then took a deep breath and at once, I could think more clearly. It was heaven to take off my wet socks and tuck myself into the sleeping bag. Imagine laying in a warm sleeping bag, listening to the rain falling heavily on the tent roof. You know that before you can pack up and start walking, you have to put on damp clothes and wet socks… not very encouraging, I know. It took a lot of willpower, but when I finally decided to get it over with, it wasn’t too bad, and soon I was on my way yet again. Around 7:30pm it finally stopped raining and the sun came out, just when I was going to cross the biggest river yet. A good sign, I thought. I walked for another hour until I came to new river. I thought of crossing it, but I spotted a perfect camping spot among the trees, so I easily changed my mind and put up the tent. With warm fingers, that’s quite easy. A whole day without rain! Woopdiwoop! And I love my new travel companion, my walking stick. To cross rivers now, doesn’t bother me as much anymore. After long last I arrived at the first DNT cabin. What a wonderful feeling. I washed all my clothes and hung them up to dry, took a bath and made myself some soup. With the fireplace blazing with beautiful, hot flames and candles lit in the cabin, I felt very comfortable. Suddenly a huge wave of fear came over me. I no longer enjoyed the cabin. On the contrary, it was too small, to dark, too warm. I had to take steadying breaths, and I understood that I was afraid of getting lost. To walk through Norway is not just walking (as I think I had expected). It’s also thinking you are lost, it’s being wet and cold all over, it’s trying to eat enough, it’s carrying a heavy load, it’s blisters and aches. Being caught up in fear as I was, I forgot to enjoy the moment and the nature around me. I have decided that when I reach Kautokeino, I will buy myself a gps. Just to make me feel safer. I wished I had practiced more map and compass. I wished I had signal on my phone. I’m so alone. It’s funny when you get things on a distance, everything becomes quite clear. I could see how caught up I had been by fear and worry, how that made everything so much more difficult. I’ve always been a very fearless person, especially in nature. But now I’ve been scared every time I had to cross a river, scared of getting lost, of being hurt, of meeting rapists, murderers and wild animals. I think it’s because I have come to realise that I’m completely on my own. I slept the whole night through. And I found a box of Nugatti that I ate from. That lifted my spirit more than anything else. But also, I woke up to a beautiful sunny morning. When I started walking, I felt that nothing could go wrong… until I realised I was going in the wrong direction.. Shoot. Turn around. Try again. 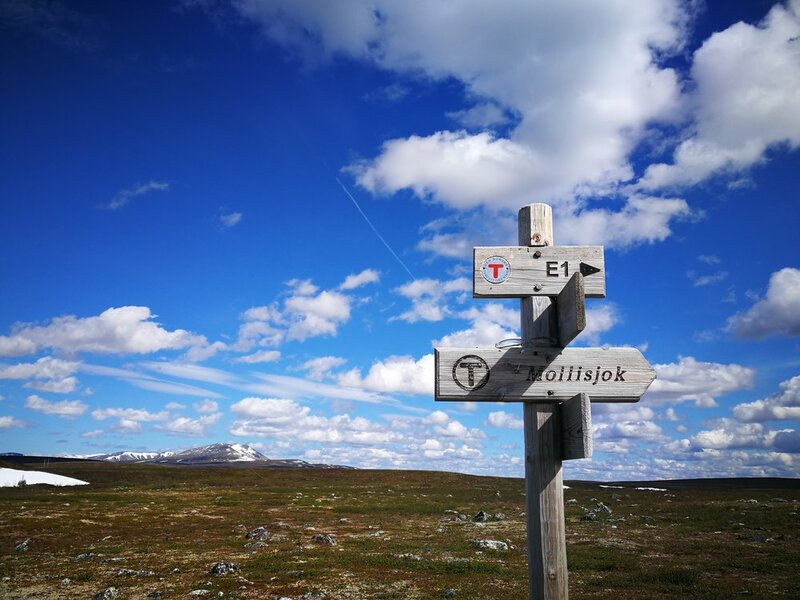 The Norwegian Trekking Association (DNT) has done an amazing job marking the trail, but because of wind and weather, a lot of the markings are gone. So I would have been quite lost if it hadn’t been for the maps I brought. They have saved me quite some times. It was a huge contrast how I felt today compared to the last few days. Motivated and light as a feather. I listened to music for the first time, singing and dancing. Probably looked like a complete idiot, but I had so much fun. After 26km I put up the tent close to a small lake, surrounded by 1000001 mosquitoes. Nice and sunny, but extremely windy. I noticed I got more and more annoyed because of it, and the more annoyed I got, the worse things got. After a couple of hours, I arrived at Mollisjoka Fjellstue, a private owned farm accommodating hikers and tourists. I went inside and when I saw the lady working there, I told her that she was the first person I’ve seen in a long time. Her reply was that I was the first person she had seen in a while too, because of the spring flood. Ah. That explains a lot. Before I left on this trip, I read a lot of blogs about people who have done this before me, and nobody mentioned anything about challenging waters or dangerous crossings. Spring flood. I’ll be damned. Behind Mollisjoka Fjellstue was a huge river. The woman told me I wouldn’t be able to cross the river on foot, so she offered to row me over the lake, so I could continue my journey. She did. Bless her forever. My hike then continued through marshes and mosquitoes. The only time I could take a break, was when it was windy. I was no longer annoyed at the wind, I saw it as a blessing, because it meant I could take a break without being eaten by mosquitoes. I tell you, I had mosquito bites on top of mosquito bites. I was breathing in mosquitoes. What a relief to reach the top of the windy mountain. 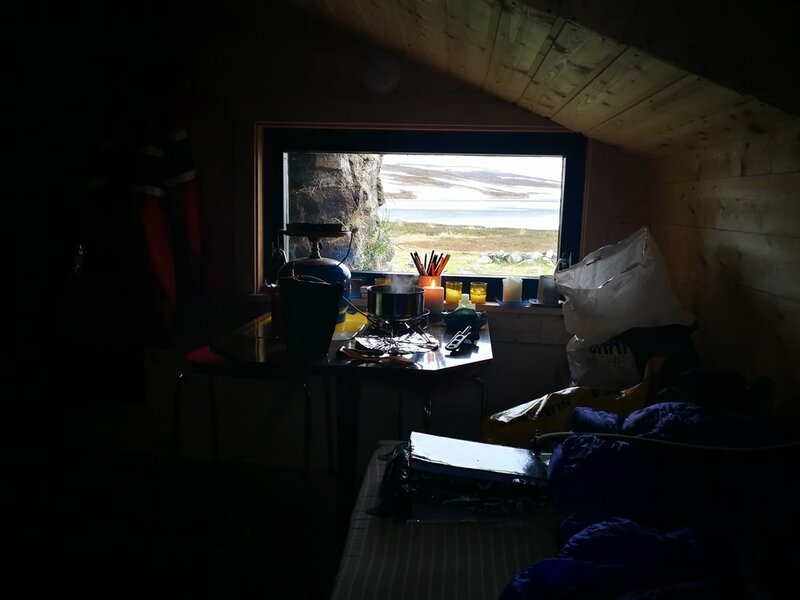 After the descent, I found myself looking at another small farm, the tourist cabin called Rágesluobbalat. I knocked on the door to the main house, and out came Josef, a friendly and helpful man who gave me the key to the cabin for rent. It was a little expensive, 400kr, but totally worth it! I even had a foot bath. My day started with a long talk with Josef. He told me a bunch of stories from the good 80’s and about that time when the bridge collapsed in the river right after he had driven over it. The very same river I had to cross later, and I almost fell in because of the strong stream. After that, I lost the trail. For an hour I wandered around and I got more and more scared and more and more exhausted. In the middle of nowhere, however, I decided to check my phone just in case I had a signal. And I had! I was then able to correct my course, an after long last, I was back on track. My plan was to walk all the way to Masi that day, but because of a sudden storm, I put up the tent, and crept in, waiting for it to pass. After only two hours of walking, I was in Masi. This was a check point I had been very eager to reach. I went to the local post office and got my fist resupply package. I then bought bread, fruit and chocolate and sat down in the small café next to the shop. Here I got free coffee and while I was re-packing my backpack, I started talking to one of the locals. He gave me loads of tips about the area, like suggesting a route from Masi to Kautokeino that would keep my feet dry. He also warned me not to camp close to the old cottage by the lake Biggeluoppal, because that place was haunted. That if it was foggy, it might be that I’ll see a ghost-man rowing his boat on the lake... Yelp! He also taught me a few sapmi words which help me decipher the map: Javri mens water, Varri means montain and Johka means river. Thank you! 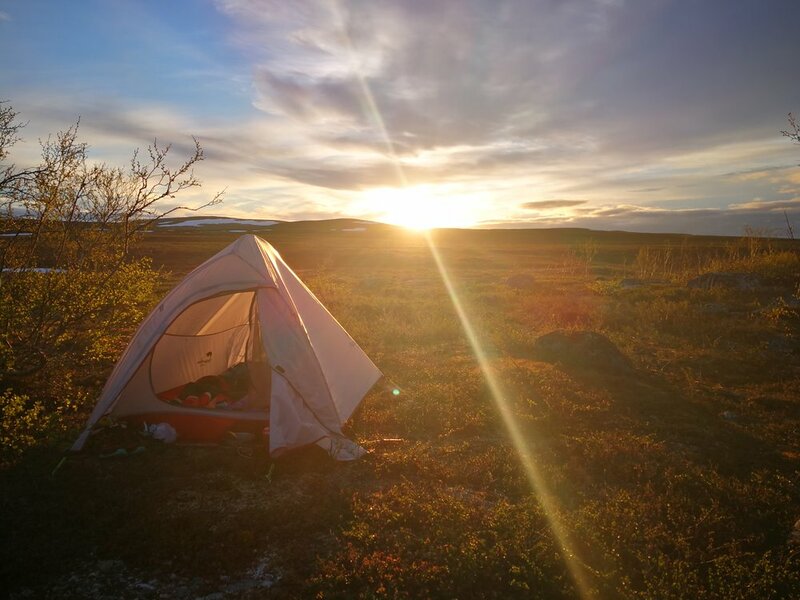 After introducing me to Sapmi rap, he gave me a hike to the camping spot where I could get something to eat and a 6-minute-shower. 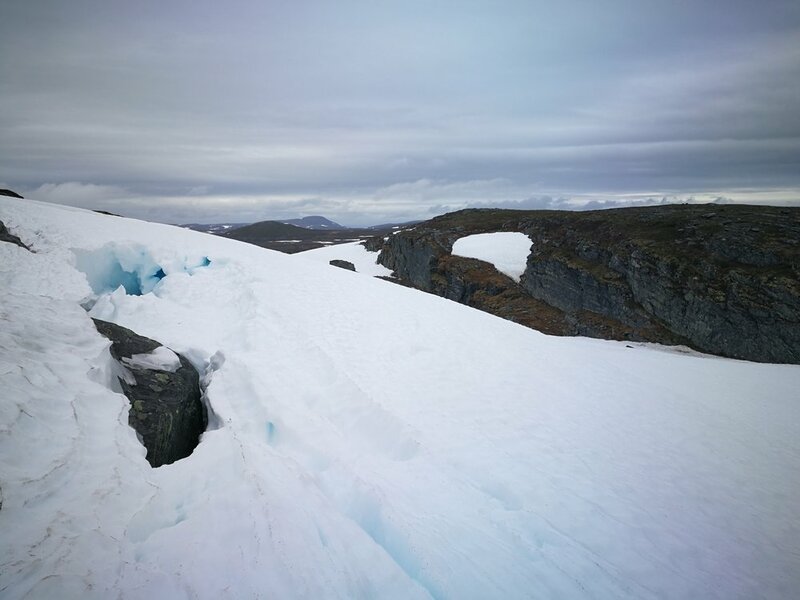 I met a mother and a daughter that had been biking and hiking through Norway for three months, heading towards North Cape. It’s nice to meet people on the trail and exchange experiences, I now know more of what is coming. Safe travels girls!